While the holidays are a happy, joyous time filled with laughter and love, it’s all too easy to be carried away with the merriment. With so much food and drink floating around, you can easily eat more than you intend to and suffer weight gain and digestive issues. We have a few ideas for you to enjoy yourself and eat sensibly. Eat with the end in mind. Thanksgiving dinners and holiday parties are fun for all, and it is possible to enjoy them without feeling deprived or worried you’ll ruin your healthy eating plan. We find it helpful to practice mindful eating as we teach in the Renew Weight Loss program. No one likes holiday weight gain, and choosing a healthy ratio of carbohydrates to protein will ensure that you can eat until you’re satisfied without worrying about your weight. If you’re careful, you can even have a few sweets without problems. If you’re the host of a Turkey Day dinner or a party, you’re in charge and can serve healthy proteins, carbohydrates, and fats. For example, you can serve mashed cauliflower instead of potatoes, make gravy with chicken broth, and offer avocado slices and smoked salmon as appetizers. If you’re a guest, look at the table and decide what you will choose to eat. Ignore the rest. Have only one small serving of anything high in sugar or simple carbohydrates. Feel free to eat plenty of fresh vegetables. Ask a friend to split a dessert with you. You may eat any food you wish as long as you keep portions small and watch nutrient ratios. Some find it helpful to eat a small, healthy snack, such as peanut butter on celery or a mashed sweet potato, to curb the desire to overeat. Don’t drink all your calories. “One drink” means one serving of liquor, which is roughly 14 grams of pure alcohol. That amount is found in 12 ounces of regular beer, a 5-ounce glass of wine, or 1.5 ounces (one shot) of distilled spirits, such as rum or whiskey. One note of caution: alcohol is high in carbohydrates and has very little nutritional value. It also lowers your inhibitions so you eat more without intending to. And you may not be happy with yourself the next morning if you have a few too many. When you’ve overindulged, drinking water will help you feel better and stay hydrated. Often when we overeat, we feel bloated, and water will help reduce that bloated feeling if you sip it slowly over the course of an hour or two. Water will also help your body digest and process food. 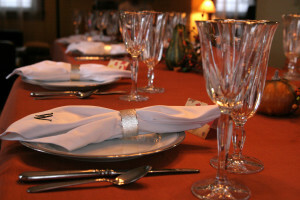 Drinking water before and after holiday dinners and parties will help your body recover faster. We suggest drinking Kangen™ Water, as it hydrates the body six times better than your city’s tap water. It also has a high pH, which is better for the body than tap or bottled water. Because you “make” it as you drink it, Kangen™ Water is fresh water full of oxygen and minerals. As your body is mostly water, the high quality of this water improves the cells of your body and protects from DNA and free radical damage. Now that you know how to navigate the food traps that abound this time of year, enjoy your holidays!